We are proud to announce the release of irk!, a board game that has given us many years of fun and laughter. In today's cyber world, we rarely engage in face-to-face human interaction with down-to-the-finish competition and hilarity. irk! provides just that, without downloads, screens or batteries; a centerpiece of many good times for you, your family and friends. Once you play irk!, you are hooked! You will actually get to know people and enjoy hours of suspense, conquest, smack talk and downright fun. Our wish is that irk!, draws you closer to those you love. Seattle-based STORYVILLE COFFEE COMPANY, which was named by Wine Enthusiast magazine as the #1 Coffee Roaster in America, is redefining the coffee experience in its four Seattle area shops and through Private Reserve, its online in-home coffee subscription program. STORYVILLE GAMES is a new addition to this lifestyle brand which promotes human connection and beauty in living. Beyond that, STORYVILLE is a FOR GIVING company, created for giving. At STORYVILLE, our desire is to support the fight against human trafficking worldwide until no child, woman, or man is trapped in slavery. Roll and strategize in concert with your partner to outsmart and outbump the opposing team. Be the first to land all eight (8) marbles in the safe zone. In other words, to win! Excercise great strength and show endless humility as you graciously accept your role as supreme champion of the known irk! universe! This game is both simple and complex, depending on your approach. This makes it suitable for a wide range of ages and skill. Somehow, irk! includes and holds everyone in its grip, takes no prisoners, and plays no favorites. Each game comes with a two-piece playing board, made of laminated oak, designed and manufactured in Munich, Germany. The game is shipped in a beautiful branded box and includes (16) marbles, (4) dice, a jute drawstring bag, and instruction booklet. Set game boards in a cross. Snap securely together. Place on the table with surface suitable for rolling dice. 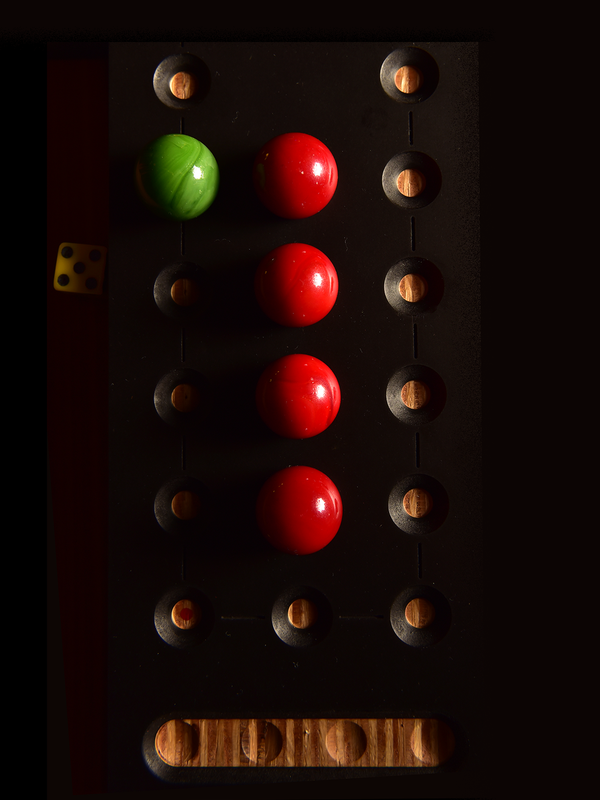 Place four (4) marbles of the same color in the home slots located at the ends of each board. Grab the die that matches your marbles. Each player rolls their die. Highest number goes first. Dice must be rolled in player’s quadrant. If a rolled die lands on the board or in another player’s quadrant, it must be rolled again. Play passes clockwise (to the left). A player’s turn is complete once player’s fingers release the moved marble. Players must roll a 1 or 6 to leave home for start. Each time a 6 is rolled, that player gets another roll. From home row only, players may go to middle, a shortcut with higher risk of being bumped. Only a 1 will get marble out of the middle to shortcut. Players may jump any marbles but their own. The first team to get all eight (8) marbles into the safe zone wins.